If there’s one thing that American viewers have empirically gained from 2017’s less-than-stellar year at the movies, it’s this: a full and comprehensive understanding of Operation Dynamo and the evacuation of Dunkirk. Christopher Nolan gave us the ground-, sea-, and sky-level view in this summer’s practically wordless Dunkirk, and now Joe Wright gives us a behind-the-scenes look at what was going on at 10 Downing Street during those fateful weeks. It’s naturally a more verbose story than Nolan’s, but it’s not until the film’s closing moments and final line of dialogue that one starts to realize that maybe that’s the point. We already got the ode to British upper lip this year, here’s the tribute to the acid tongue. Mostly, that tongue belongs to Winston Churchill (Gary Oldman), who as the film opens is days away from being appointed as Neville Chamberlain’s replacement as prime minister. We first meet him in the narrow bed of a dusty attic room, dictating to his new secretary Elizabeth (Lily James), ensconced with a wide tray full of all manner of English breakfast. (Churchill’s breakfast gets a couple of percussively edited spotlight sequences; rashers of bacon pooled in grease are to him what spoons and needles were to the junkies of Requiem for a Dream.) Oldman is barely intelligible under layers of impressive prosthetic jowl, and quick to temper; it only takes a few minutes for his Churchill to send Elizabeth into tears. Enter his wife, Clementine, played with caffeinated brassiness by Kristin Scott Thomas, who throws herself dramatically back on her husband’s work-bed and tells him he has to be more likable if he’s to get anything accomplished. He takes this under advisement, and as an initially unpopular PM (he was the only Conservative in Parliament thought to have any sway over the opposition parties) his gung-ho “never surrender” speechmaking rubs some people the wrong way, and is privately denounced by King George (Ben Mendelsohn, patron saint of insecure men) as reckless. But he soon becomes embroiled in a much more fateful debate; the push by Chamberlain and Viscount Halifax (a pursed and perfectly loathable Stephen Dillane) to engage in peace negotiations with Hitler, or to press on with the war, however hopelessly the deck is stacked against them. 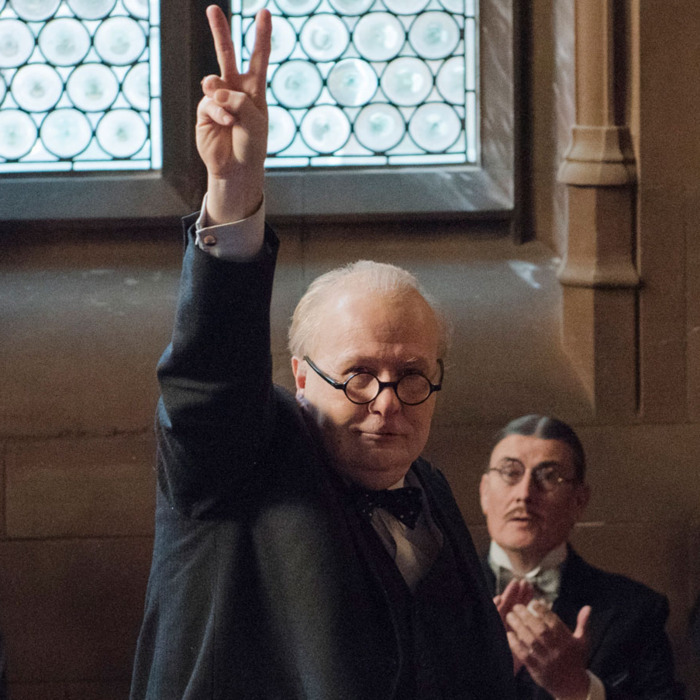 It’s easy in 2017 to root for Oldman’s Churchill on this particular issue; if you’re looking for a nuanced portrait of a still-controversial figure, the worst you’ll see of the prime minister here is that he could be a bit short with people. As the title of Wright’s film suggests, this was not a time in British history where there was room for many shades of gray, or hemming and hawing over past records. But Wright doesn’t merely brush past Churchill’s shortcomings, he builds myths wholesale, including a climactic scene where Churchill descends among the people for a Tube-side chat about fascism. The resounding takeaway is that fascism is bad and we should fight it, and it’s hard not to feel a stir of “damn right!” during this scene, despite its fictitious nature. In fact, that is the best way to enjoy Darkest Hour, with a slab of salt and an understanding of Wright’s irrepressible stylishness as the substance itself. (My friend, fellow critic, and partially British person David Sims described it as a “Churchill ballet,” which is a gorgeously succinct and accurate description.) The details aren’t as important as the grand sweep, and these historical figures are tools to illustrate big, fat human themes of perseverance and identity. The Hollywood-perfect witty banter and visual flourishes (Wright likes to isolate the smoky, windowless chambers of Churchill’s HQ and frames within frames, highlighting the intensity and isolation of the characters) give away the main game, which is to entertain and inspire. Wright has an eye for big faces, and not just Oldman’s mostly disguised countenance. Everyone seems to be a walking embodiment of an essence, not cartoons exactly, but something more totemic. If all this makes Darkest Hour propaganda, then the shoe may fit, though it’s hard to find fault with its protagonist’s aims, at least in this small of a scope.